In this section we have video and audio resources, our archive of newsletters, and some information on 21st century books about James Clerk Maxwell. We also have the following documents relating to James Clerk Maxwell. Downloadable documents are in PDF form and will open in a separate window, you may save a copy if desired. You will need the free Adobe Reader ® installed to read them. A good selection of our updated wall panels (as displayed at James Clerk Maxwell’s Birthplace museum) are now available for download. An example is shown here, the downloads are high resolution PDFs which, if printed full size, are 1m high. Between Newton and Einstein, James Clerk Maxwell Stands Alone - a timeline of Newton, Maxwell & Einstein. Colour - describes JCM’s contributions to colour theory. Electromagnetic Theory - generally recognized as Maxwell’s greatest contribution to science. Governors and Feedback Control - the origins of cybernetics. Maxwell-Boltzmann Distribution - the origins of statistical physics. Newton Maxwell Einstein - More on the relationship between the work of Newton, Maxwell & Einstein. Reciprocal Figures for determining forces in framed structures - Maxwell’s contribution to Civil Engineering. Saturn’s Rings - Maxwells revoltionary theory of the structure of the rings, confirmed by NASAS in 2004! Transatlantic Cables and the Ohm - Maxwell’s contribution to the Standard of Electrical Resistance. Aberdeen Wall Panels - we also have a set of wall panels prepared by Dr John Reid for events in Aberdeen, these are particularly oriented to JCM’s period as a Professor at Marischal College, Aberdeen. 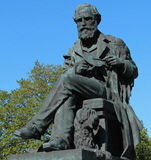 List of Books and Scientific Papers written by JCM, including those not in Collected Works by Niven, Sir W D (editor) (1890) The scientific papers of James Clerk Maxwell, Cambridge University Press. Mathematical Tripos and Smith’s Prize Results for the years 1845,1848, 1852, 1853, 1854. Stokes Smith’s Prize Paper of 1854 sat by JCM, with Stokes’ Theorem as a question. Smith’s Prize questions set by JCM in 1879. This includes the accepted solutions submitted in response to the prize offered by the Foundation as part of the 175th anniversary celebrations of of JCM’s birth. Francis Galton Questionnaire In about 1870, Francis Galton conducted a survey of well-known scientists on which he based his ‘English Men of Science’. Maxwell filled out Galton’s questionnaire himself. James Clerk Maxwell’s 1871 Paper to the London Mathematical Society where he suggests the word ‘curl’ for a vector quantity. James C Rautio’s digitized version of the above Campbell and Garnet biography (which includes a whole section on his poems). Prof. Duncan Macmillan FRSE The Scotsman, 5th December 2008, reproduced by permission. Toby’s Statue - Maxwell’s Home Preserved, His Statue Unveiled, but the Final Word Is from a Child. James C. Rautio IEEE microwave magazine June 2009, reproduced by permission. 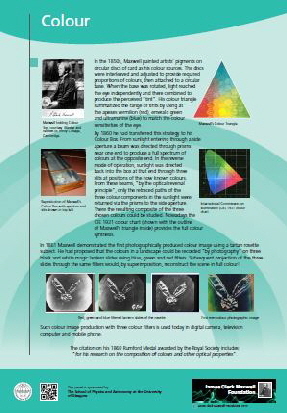 Commentary on The “Tartan Ribbon” the first full colour photographic image. Tripos List of 1852 and 1854, with Tait as Senior Wrangler (1852) and Maxwell as 2nd Wrangler (1854). Smith’s Prize List (winners in the different years including Maxwell and Tait). Obituary Tributes to JCM by W. Garnett in Nature, and in Royal Society Proceedings (Vol. 33). List of JCM’s scientific apparatus of his own invention (e.g. colour top, dynamical top, Saturn’s rings etc.)19. Family Tree of Cays (mother’s side) includes some 150 relatives to present day including a former Master of Emmanuel College, Cambridge; mathematician at Bell Labs. USA etc.